DNA polymerases synthesize DNA in the 5' to 3' direction, using one strand as a template to generate the complementary strand. Replication of DNA begins at a specific sequence, called the origin of replication, and then proceeds bidirectionally, creating two replication forks. ■ Why is a primer required for DNA synthesis? 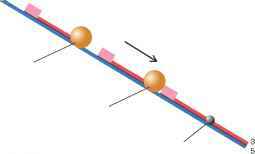 ■ How does synthesis of the lagging strand differ from that of the leading strand? 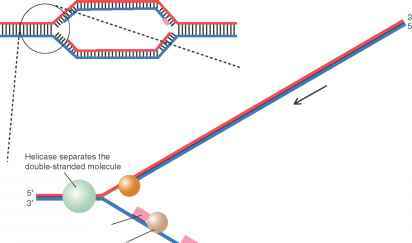 ■ If DNA replication were shown to be "conservative,'' what would this mean? Synthesis of the leading strand proceeds continuously. Synthesis of the lagging strand is discontinuous; synthesis is reinitiated periodically, generating a series of fragments that are later joined. Figure 7.6 The Replication Fork This simplified diagram of the replication fork highlights the key steps in the synthesis of the lagging strand.